From the mainland to the Island, the densely populated Ikeja,Ijesha, Isolo to the highbrow Victoria Island, Lekki and Ikoyi,the embarrassing sight of the decrepit roads confronts you in dare-devil fashion. State-owned roads are just as horrible as stretches of roads controlled by the federal government. 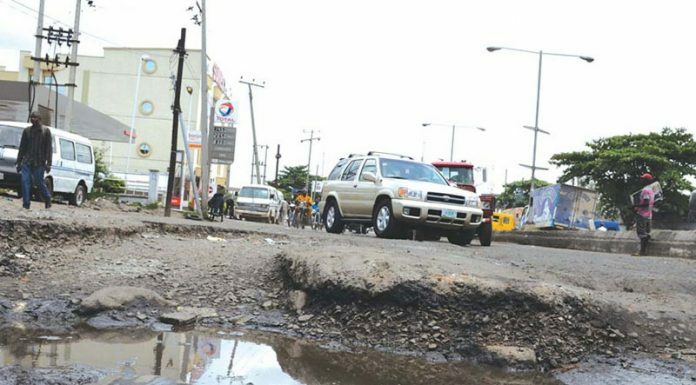 From expressways to the inner streets, it is tale of neglect and abandonment, promises delayed or even out rightly forgotten, as Lagosians groan under dilapidated roads littered with crater-sized potholes and gullies. Sometimes, traffic robbers take advantage of the dilapidated roads to dispossess motorists of their valuables. All over the world, one of indices of visible development are motorable roads but in Lagos and other parts of the country, not only are the roads bad, they are death traps. Ever busy roads such as Herbert Macaulay, Agege Motor Road, Lawanson-Itire, LUTH-Idi-Araba are a nightmare. Generally, roads in Yaba, Mafoluku, Oshodi, Ogba, Ojudu, Ketu, Agege, Mushin, Surelere, Bariga, Shomolu, Oke-Odo, Abule-Egba and other areas are in a terrible state. The depth of gullies at the Agege Motor Road by Mushin Bus-Stop is simply unbelievable. Mushin-Ikotun Road is a long and narrow stretch connecting commerce and residential areas in the state. Come day or night, weekday or weekend, the road is perpetually on lockdown. Repair works that were recently carried out in between Ile-Iwe Metta, Aye and Ire-Akari had been washed off. Same for Kogberegbe junction, Pako Roundabout, Jakande-Gate, NNPC Junction, Iyana-Ejigbo, Powerline bus stop, Agodo, Ile-Iwe and the descent inwards Ikotun roundabout. The narrative is not any different commuting from Ile-Iwe Ejigbo inwards Oke-Afa and Ajao Estate. The ever-busy Ikorodu Road is not spared. Failed portions dot most bus-stops, hindering free flow of traffic. From time to time, people have questioned the whereabouts of the state government and even the local governments. Letâ€™s not forget Apapa that is totally cut off from other parts the state due long years of neglect by both the federal and state governments. Added to bad roads is the embarrassing flood seen on bridges such as Eko Bridge, Osborne and Ikoyi each time it rains, making movement difficult for motorists. This is usually due to the blockage of channels that ordinarily should make easy flow of water possible. In the past, while the state government concentrated on major roads, local governments were given the task of fixing some inner roads. Today, these two tiers of government have long gone to sleep, leaving the people to suffer. Lagosians now spend more on constantly repairing their vehicles. Because of the state of roads in city, people now prefer driving Sports Utility Vehicles (SUVs) which are not even exempted from constant break down. So bad are roads and other infrastructure in the state that The Economist Intelligence Unit and World Bank in their 2018 Global Liveability Index, recently ranked it the third worst city for humans to live in the world. The state was ranked 138 out of the 140 cities considered for the ranking. This, however, was a slight improvement from the 2017 ranking, where the country was ranked 139th out of 140 cities on the index. According to the latest ranking, Lagos only outperformed Dhaka in Bangladesh and Damascus in war-torn Syria. Out of an overall score of 100, Lagos was rated 38.5 points. The ranking was based on Social Stability, Healthcare, Education, Culture and Environment and Infrastructure. To know that the state government gets about N50billion monthly from both internally generated revenue and allocation from the Federation Account, yet the roads are bad, is most annoying to residents. It was to bring development closer to the people, that the state government in 2004 carved out 37 development councils from the existing 20 local government areas. Today, to many Lagosians, not only is development still far from the state, the importance of the development councils and local government area is hardly felt. Initially, to divert attention and exonerate itself from the accusation of incompetence levelled against it, one of the dummies the state government sold to the people was to designate some roads as federal roads and regularly blame the federal government for neglecting the state. This narrative has since been defeated with the All Progressives Congress (APC) controlling the federal and state governments and a former state Governor, Babatunde Fashola leading the Federal Ministry of Works. Today, the impression most Lagosians have of the government is that it is incompetent and insensitive. When Governor Akinwunmi Ambode assumed power in 2015, his first task was completing the road projects which his predecessor failed to complete before leaving, immediately winning the hearts of Lagosians. Such road projects were Ago-Palace road up to Cele Bus Stop and others. Soon after, he embarked on flyovers in Ajah, Abule-Egba, Pen Cinema. In no time, the governor was hailed as a messiah. But all the praises showered on him has since vanished as Lagosians find it difficult to drive through even less busy roads. Sometimes people wonder if there is still any semblance of government in the state due to the slow pace of response to road repairs. Any time issues concerning the state of roads are raised with the officials of state governments, they are quickly dismissed, with attention drawn to the Airport Road, Oshodi Interchange and Pen Cinema projects. This has left many Lagosians wondering if these are tenable reasons why other road projects should be abandoned. Recently, the state government opened a WhatsApp platform for residents of the state to lodge complaints about bad roads in their area. Information about the platform, which is run by the state Public Works Corporation, has been spreading rapidly in the last few days. The message going round on the existence of the platform says: â€œYou can now lodge complaints about bad roads in your area to the government.. simply take pictures, caption it and send to *Lagos State Public Works Corporation* on WhatsApp â€“ 07088881841. No calls, WhatsApp Only.â€ But that is where it ends. Messages sent to this platform have not been acted upon. Lamenting the bad state of roads in Lagos to THISDAY, a banker, Abimbola Lekan, said as far as he is concerned, there is no government in the state. He warned that if Ambode does not redeem himself soon, he will go down as the worst governor the state ever had. Another respondent, Ikechukwu Nwosu, questioned the quality of materials and work done, saying most the projects were not built to last. Nwosu, a civil engineer, observed that the major problem of road construction in Lagos is the lack of proper coordination among the relevant ministries. He said: â€œThe Ministry of Works awards or deploy contractors to fix the road, but to what extent is the Ministry of Environment ensuring that the drainages are not blocked? That is a problem of coordination. What I have seen with them is that they build or repair the road, most times with questionable materials. â€œWe are not surprised that Ambode is not coming back, he has done poorly in the three and a half years. We have never had this bad in Lagos in terms of roads. We are suffering. Move round the state and see thing for yourself. It is very embarrassing,â€ said Funmilayo Ganiyu, a resident of Mafoluku. For Ikenna Amadi, the suffering Lagosians go through moving from one part of the state to the other is too much. â€œWhat we go through moving from one part of the state to the other is too much. We have state and local government authorities. Our sufferings are too much and it is a shame. The travel time of about 30 minutes now takes us two hours or more. Please, help us to beg them to ease our suffering in these areaâ€, he said. However, a civil servant, Adeyemi Adejumo, commended the massive infrastructure development in the state, although he raised concerns of it being one too many at the same time. â€œThe state government is trying but my problem with all these projects is that they are all happening at the same timeâ€, he said.